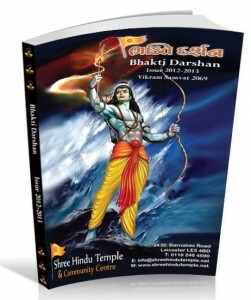 Shree Hindu Temple and Community Centre publishes an annual publication called “Bhakti Darshan“, distributed free to all devotees through out the year. New edition is published on Diwali every year. Publication contains news articles, event diary, panchang, a highlight of previous year’s events and also highly interesting and religious articles. New “Bhakti Darshan” is for everyone old and young. There’s something for everyone to read and interact with. If you would like to write an article for Bhakti Darshan then please email us at info@shreehindutemple.net or come to mandir office. Article can be in Gujarati or English.